There's nothing like the real thing. The Original Columbia River K.I.S.S. knife with its Tanto-inspired blade and bead blast finish is the revolutionary high tech statement by Knifemakers' Guild Member and K.I.S.S. designer "Daddy K.I.S.S." Ed Halligan. It stands for "Keep It Super Simple." It's one honey of a knife, precision fine blanked for superior fit and smooth operation. Ed Halligan's unique two-piece construction features an integral Frame Lock, and a breakthrough design which seals the cutting edge against the handle. A thumb stud is used to one-hand open the blade, and as the blade is fully rotated open, the Frame Lock snaps crisply in behind the blade to guarantee a sound lock-up. 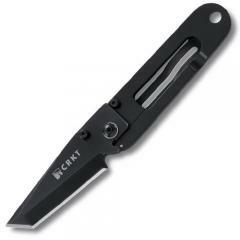 The blade can be closed with one hand, simply by releasing the Frame Lock. Both knife blade and frame are AUS 6M stainless steel in a fine bead blast finish.